I love you Levi and miss you. So much that has been said rings so true. He made everyone feel like they’re something special and unique. That may sound nice, but with Levi it is really true. What a gigantic neshomo and heart he had. For everyone who crosses his path, be it an irreligious Jew, a fellow chosid, or just a stranger… to be made to feel like they’re really special… that was what Levi would achieve. That's real ahavas yisroel! "I have a little Sukkah with four walls and a door, it doesn’t have a ceiling, it doesn’t have a floor. The schach, will be the ceiling, the earth will be the floor, add some decorations. its ready now for sure". He sang it with joy and humor and a childlike lisp... Our Mushka was hysterically laughing and in love with him each time he sang it. Fast forward ten year, eleven years. Our mushka was then twelve, thirteen years old. She still remembers Levi vividly and the song he sang. For many long months, she, along with thousands of others, said daily tehillim for his complete recovery, praying that he would continue to spend many more years with Miriam and his children and community. On erev sukkos 5770, days after yom kippur we were told Levi was unable to lead his congregation on that Yom Kippur and that things had taken a turn for the worse. Suddenly there's a phone message on the voicemail at our home, just hours before sukkos. It was Levi. He had nothing more important to do that day then to leave a message for our Mushka, singing the "I have a little sukkah" song... needless to say he had all of us in tears, including our now much grown up Mushka who just couldn’t believe it. Another year passes. A difficult year for Levi and his family. I'm quite aware from visiting with Levi and talking to Miriam that things aren’t great and that he's gone back to VA because there wasn’t much they could do for him in NY. But there it was again, Erev Sukkos 5771 (!) a voice mail from Levi Deitsch, "I have a little sukkah..."
In a brief visit with Levi in Crown Heights last summer, when things were not so good... Levi was pounding me on why I don’t send enough kids to mayanot which is the way to bring them really close to yiddishkeit. This had been a discussion between us numerous times... but here he was again, the conversation wasn’t about him, his hardships, etc but about the work of Shlichus. Although, as usual he never spoke about himself, a few times in the conversation he exclaimed: “My wife, Miriam, she's my everything. she's my everything...” - Surely Levi will make sure to arrange that EVERYTHING should go well for his EVERYTHING here on earth begashmiyus and bruchniyus. A week later, I am at the ohel and Levi is there with his Rebbitzin. Again, he is sitting with a mekurav, a yid who did not look frum, giving him chizuk and instructions. I was there davening for my little tzoros, and there I see this giant of a chosid totally and completely focused on another yid and on his shlichus... literally with his last kochos. That image will stay with me forever. It removed my excuses to complain and be grouchy for whatever happens in life... to me it was an image of a real chosid, much as one would see in generations bygone, but in the modern “dor-hashviei” model. A chosid. A jew permeated with emunah, bitachon, and ahavas yisroel. Like everyone else, I have no idea why this happened. 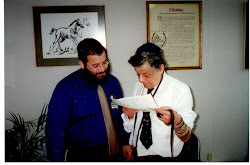 But it is clear to little me, that these amazing people who get hit this way - Levi, and his amazing wife and their children, and the entire Deitsch mishpocho who were hit so hard of late... all being the best of the best lubavitch has... and the questions are all begging to be asked, why why why... It is clear to me (these are just my own feelings but I’m sharing them for what it’s worth) that as the gmoro says vohavov ktzeis hashemesh bigvuroso, those who love Hashem will shine on that Great Day like the sun in full glory. The gomoro explains that this refers to hasmeichim byisurim rl... those who rejoice despite their afflictions. All of those aforementioned, those who were taken from this amazing family and all those who were affected so deeply, each and every day by these tragic loses... they are the real special ones. The ohavov, the ones who love Hashem. Hashem has in store for them such goodness (as the Rebbe writes that miyom holchi lecheder... from the day I went to cheder… he thought of the good that Moshiach would bring… it’s got to be so good as to make up somehow for all the tzaar hagolus… the pain of exile…) They will all get the real goodness on the big day. They are real chasidim and real jews and Hashem chose them. But they will be the ones to know true goodness. May it be very soon. With a heart overflowing with love and admiration for Levi and his family, I write this in the name of my entire mishpocho, my wife Sara - and of course our now 14 year old Mushka. Levi was truly special, larger than life.